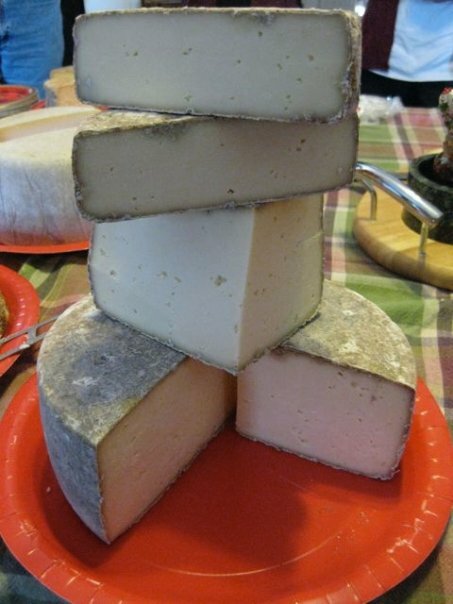 Besides the warm and spirited hosting by Liberty Fields Farm, our Holiday Party featured seven different Tommes made from the same recipe but each bearing the flavor, milk type, local flora and personality of the cheesemakers around the state. There were hard and soft pate’s, there were buttery and silky textures, there was “goaty” and “cow-y” and complex flavors — sometimes all in the same cheese (Appleton Creamery brought a triple-milk version). There was also bright red local membrillo to accompany the panoply of personal cheeses. It was a lesson about how much of the local cheesemaker goes into making their cheese.